Arianespace said the basic assembly of its Ariane 5 ECA has been completed with the installation of the rocket's guidance and control systems. Those systems for Ariane 5 ECA - which is scheduled to launch the Satmex 6 and THAICOM 5 telecom satellites in early 2008 – complete the integration of its vehicle equipment bay, also known as the launcher's brains. 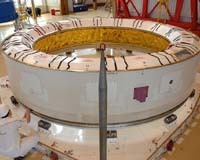 Supplied by EADS Astrium, the ring-shaped component is equipped with the power distribution system, flight control unit, telemetry system and other elements for guidance, orientation and sequencing during Ariane 5's mission. It includes advanced laser gyros for accurate orbital injection. Next, the rocket will be transferred to the final assembly building at Europe's Spaceport, where technicians will install the mission's two satellite payloads. Lockheed Martin's JCSAT-9 telecom satellite, designed and built for JSAT Corp. of Japan, was successfully launched at sea Wednesday afternoon aboard Boeing's Zenit-3SL rocket, which lifted off from the company's Odyssey semi-submersible platform, located at an equatorial site at 154 degrees West longitude.